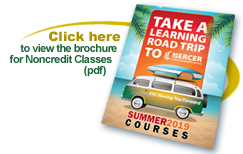 Mercer County Community College's Camp College mission is to provide the finest camp experience for children; an experience that will be remembered for a lifetime. Camp College is committed to quality and excellence in everything we do by providing carefully designed programs and activities, a dedicated and experienced staff, and a caring and safe environment with state of the art facilities. Through education with an emphasis on hands-on activities and fun, we offer children the opportunity to achieve, to develop self-esteem and self-confidence, and to grow. Camp College is proud to serve all the great communities in Mercer County including, Hamilton Township, Trenton, West Windsor, Robbinsville, East Windsor, Cranbury, Bordentown, Yardley, Princeton, Lawrenceville, Hopewell, Cranbury, Monroe, Freehold, Cherry Hill and more. Check out our adult offerings for professional and personal development at www.mccc.edu/ccs or click on the latest course catalog below!